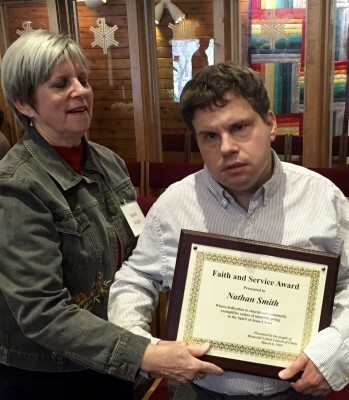 Every year, Memorial United Church of Christ honors one or more members with the Faith and Service Award in recognition of exceptional use of time, talent and treasure in the work and witness of our congregation. The award is usually presented on the Sunday in March when we also receive the One Great Hour of Sharing offering, which goes to help deal with emergencies and on-going development all over the world. This recognizes the commitment of Memorial and its members to reach out in ever-widening circles. Other special awards are for Lifetime Service and for Youth Service. “Back in 1997, when my family joined the church, there was a new, energetic pastor at Memorial. It was also time to start a new confirmation class. “I still remember all of us 6 young women at the introductory meeting at Bonnie’s condo. From what I heard, confirmation was about memorizing Bible passages – pretty boring stuff. Turns out, Bonnie’s confirmation class was so much more. “Every other Sunday, our evenings were filled with lively, deep discussions that moved from the church library to the kitchen for pineapple pizza and out to the parking lot when our parents picked us up. Bonnie was the pastor here from 1997 to 2009, but that’s not the reason she is getting this award today. Pastor’s get enough other rewards in the midst of serving a community of faith. But clearly as pastor, Bonnie had a huge impact on the lives of faith and service among the members of Memorial. Since Bonnie retired in 2009, though, 139 new members have joined Memorial – most of whom never experienced Bonnie in the role of pastor. They have experienced how she continues to live out her faith in service to our community and the wider community. You may experience her as a member of the bell choir, like this morning, or as chair of our Membership Committee, that helps welcome and nurture everyone here. You may know her as someone who forged our partnership with Christmas Lutheran Church in Bethlehem and who has led multiple trips to Israel and Palestine to deepen our connection with our sisters and brothers there. You may know her as the person who helps organize meals for students at The Crossing on the UW campus. She has continued to go on work trips to Back Bay Mission. Beyond the walls of Memorial, she also has been an active participant in the Prison Ministry Project, working with men in prison. She has served the wider UCC at regional and national meetings and serves on this region’s Division on Church and Ministry. Which brings up one final and more personal note. Bonnie was on the committee that helped guide me into ministry in the early 2000s and has been an amazing teacher and colleague and friend ever since. So it is with great delight and Kaitlin and I get to present this 2017 Faith and Service Award to Bonnie Van Overbeke. Here’s a video of the presentation to Bonnie. When John Van Overbeke passed along the role of minister’s spouse to Ellen Reuter in 2009, he offered to show her where all the mousetraps were set around the church. She declined the offer. But she has been a vital presence within the church in the realm of spirituality and art, even if not so much in pest control. Almost every Sunday when you come into the sanctuary, you see a bit of Ellen’s artistic vision. She would be the first to say that she does not do this alone. There’s an incredible crew on the worship committee that brainstorms ideas and turns them into reality. But Ellen has been the creative spark behind so much of what you see in this room. She connects creativity to artistic expression at the craft retreats she has helped lead over the past several years. She inspires creativity in others as they meet with her. She uses her own creativity to create a variety of items that have been sold at our annual Craft and Cookie sale. And then she has helped people at Memorial explore their spirituality and faith in many ways. She led a series of Lenten programs known as Companions in Christ. She led a class called The Hymns of Our People that explored church history through music. She led sessions on mindfulness and meditation. Through it all, she has deftly walked that tightrope that pastor spouses have to walk and brought beauty, joy and wisdom to Memorial. For that we are grateful. Here’s a video of the presentation to Ellen. 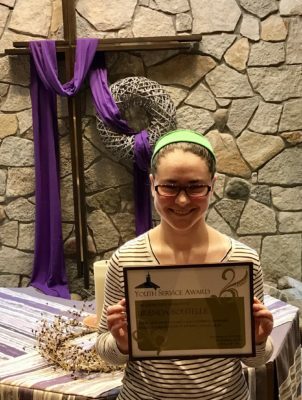 This recipient has been a tremendous help to me (Rebecca Malke) in the faith development program. She has taught Sunday school, helped out in the nursery and has been a helper in our Vacation Bible School program. But her work at Memorial doesn’t end with the faith development program. She has been involved in our annual Night of Music event and is part of Memorial’s instruments. She has walked in the annual Crop Walk event on our Memorial Walkers team, helped out with the essential’s pantry and has made blankets for the Ronald McDonald House. One of the things that makes Brenda Boutelle so great is that even though she is a very busy youth at West High School, she is always more than happy to help me when I need it, even if it’s last minute. Often I don’t even need to come to her she comes to me asking me if I need help, or volunteering her time to our children. And our children love her too. It takes a village to raise a child and I’m glad Memorial has Brenda Boutelle in our faith village and I’m happy to present to her the Youth Service Award. Here’s a video of the presentation to Brenda. 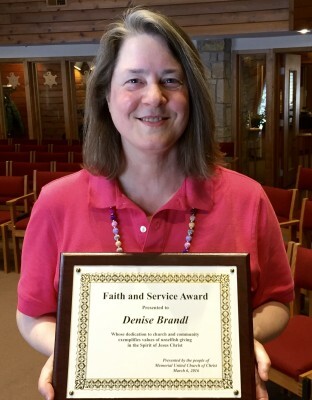 When Denise Brandl became a member of Memorial in the fall of 2004, she brought to the congregation a valuable set of skills and a deep passion for helping. Her accounting skills have served Memorial well over many years. As our church accountant, she makes sure that all of our money is being handled properly – both the money coming in and the money going out. She prepares the monthly financial statements for the trustees and members of the Council and she puts together all of those pages of financial information at the back of the annual report. The time she spends at this is invisible to most of us – but you might see her working her long hours on Saturdays, coming in on holidays, devoting much of her time and energy to making sure our financial systems here are in excellent shape. That is no small matter. But over the past dozen years, Denise has done more than add and subtract numbers. For many years, she was one of the folks behind the glass in the media room. She went with a work crew to Back Bay Mission in Biloxi in 2007 and helped out with the Road Home when Memorial was buddy congregation with St. John’s in Oregon providing space for homeless families. 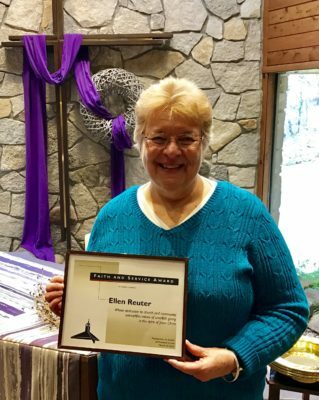 She has served on the Outreach Committee, worked at garage sales and craft and cookie sales and helped the congregation think through staffing patterns. So much of what Denise does is behind the scenes. So it is wonderful today that we can invite her up front to receive one of the 2016 Faith and Service Awards. Our second award recipient really has lived and breathed faith and service throughout her life. Those of you who know her from the 18 years she has been at Memorial will understand that. But her life of faith and service goes way back – even back to her days at her beloved Lakeland College. Yes, Nona Suhr, this award is for you. Whether it has been as a mentor to confirmands or a liturgist on Sunday morning, Nona has been a steady presence in the spiritual life of Memorial. Whether it has been organizing things in the library or stuffing envelopes for mailings, she has been a long-term partner in the daily operations of Memorial. Whether it has been hiring teens from the church to help out in her yard or supporting students at Lakeland College with scholarships, her generosity has been extraordinary. The list of things that Nona has done here over those years stretching back to 1998 is amazing. She has served on the church council and most recently, she started a caring team ministry so that members of Memorial could be looking out for one another, much as she has across the years. 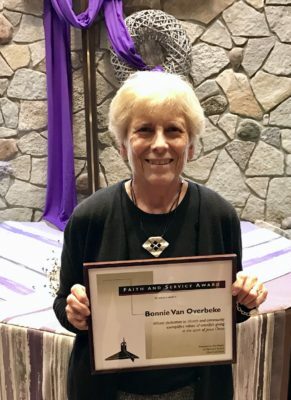 Nona’s passion for the wider United Church of Christ, for its institutions like Lakeland College, for her church home her at Memorial are all part of the way she lives out her faith in service to this community and the wider community. 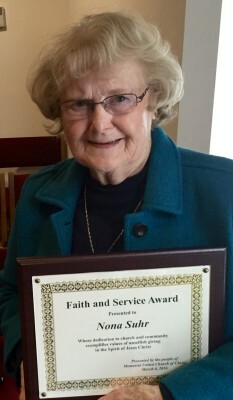 We are so grateful she is in our midst and so pleased to give her one of the 2016 Faith and Service Awards. If you have been around Memorial for any length of time, you have gotten to know Nathan Smith. Nathan has grown up at Memorial, being an integral part of this community even though his autism has limited the ways he could participate. In his 38 years of life, Nathan has grown to appreciate a wonderful array of activities. He is an avid UW hockey fan (although that was harder this year). a Green Bay Packers fan, a Milwaukee Brewers fan and Madison Mallards baseball. He has gotten to many games of his favorite teams over the years. And he’s even been known to watch golf and bull riding – talk about two sports with incredibly different levels of action. He really enjoys music, so he gets to appreciate that when he is here. But he loves music by John Denver and the Muppets and lots of other musicians. He enjoys going out to eat with his family or going to the dances and Halloween parties put on by the ARC Dane County. There is paid staff from Dreamweavers that takes care of Nathan most of the time, but when he comes here, he is with family – Sue and Bob, of course, but also with the rest of us. So we are happy to honor Nathan today. 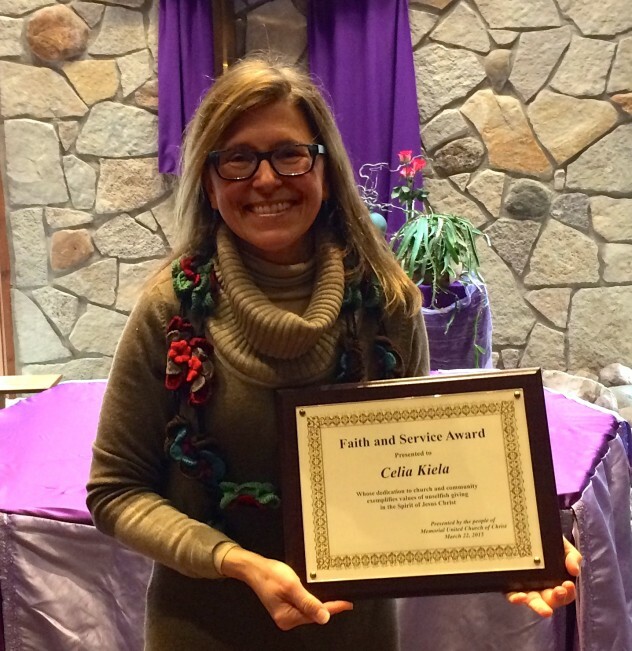 Like many people at Memorial, our first Faith and Service Award recipient has played many roles her over the years. She has been a Sunday school teacher, a liturgist, a Confirmation Mentor, made food for Luke House. But then she has done so much more. Celia Kiela chaired our stewardship committee for three years from 2007 to 2009 and had served on the committee three years before that. She led our task force in 2010 to rethink our routines here on Sunday mornings for worship and education. She has used her amazing artistic talents to create jewelry for our annual Christmas sale to raise money for our Bethlehem project. And last fall, she took on the task at the last minute of running our Silent Auction. Through it all she is a thoughtful presence in our congregation, an amazing mom to Elliot and Natalie and a wonderful partner to Jay. We are so grateful to have Celia in our midst and so happy to give her our Faith and Service Award. Our second Faith and Service Award recipient has also covered a lot of territory here in the decade that she and her family have been part of Memorial UCC. You hear a bit of her presence as she plays with the Bell Choir. She has been part of our Luke House team and has been a confirmation mentor. But the place where Jackie Neidhart’s presence here has touched so many people is in her work with our Adult Programming Committee to provide the threads for our social fabric here. She got involved with that committee soon after her family joined Memorial and has chaired it since 2010 – although she is now ready to pass on the leadership. Along the way, she organized trips to American Players Theater and to Mallards baseball games. She helped create our new chili cook-off and has worked on Easter breakfasts and grill outs and so much more. She did all this while guiding her two daughters – Eliza and Anna – through amazing academic, athletic and musical accomplishments and being a loving partner with Jim all along the way. 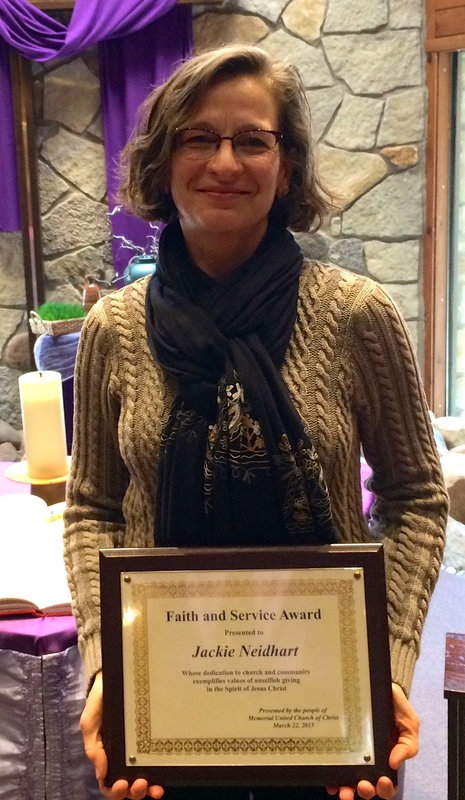 We are so grateful to have Jackie in our midst and so happy to give her our Faith and Service Award.